When people ask me how she came into my life, I would say “she came with the house.” It sounds glib, but it’s true. When Jenny and I bought the house on Avenue G at the beginning of 1997, Squeaker was already living there as a street cat. She had been looked after by the previous occupants. When we showed up, she initially kept her distance (hanging out at a neighbor’s place instead), but after a few months, she warmed up to us. When the first freeze of the winter came at the end of ’97, Jenny and I agreed to let Squeaker spend the night indoors, just for that one night. Apart from a couple of forays into the back yard, she never went outdoors again. 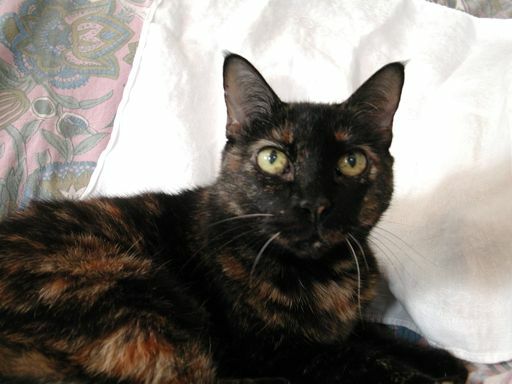 Squeaker was already an adult when we took her in—our best estimate is that she was born in 1990. She was compact, stout, and stiff-legged, never jumping but frequently clambering up onto whatever surface she wanted to occupy. She enjoyed surprisingly forceful head-butts, and never played with toys when anyone was watching. A lot happened to me over the intervening years—one marriage ended, another begun. I broke my pelvis. I sold the house on Avenue G and bought the one I live in now with Gwen. Squeaker was with me through all of that. She was not unmarked by time. In 2004, she developed a growth on one foot that ultimately required two toes to be amputated. That growth re-appeared on her foot, but never obviously went beyond that. Over the past few months, her stiffness of leg turned into painful arthritis. She developed hyperthyroidism, meaning her pulse was always racing, she was constantly hungry, and losing weight. I put her on a painkiller for the arthritis. She still seemed to be generally happy, but I realized she was in the endgame. Over just the past few days, she declined precipitously. She lost her appetite and even had trouble drinking water. Her meow, which had always been stentorian and scratchy, became pathetic and weak. She smelled awful. It was time. I had the vet make a housecall to euthanize her. If anything, I should have done it a few days earlier. Her last day was peaceful. Gwen and I went through this about a year and a half ago with the cat she’d had for even longer, Oscar. It doesn’t get easier with practice. I don’t look forward to going through this with my own four legged companion, so I try to enjoy every moment we have in the mean time.